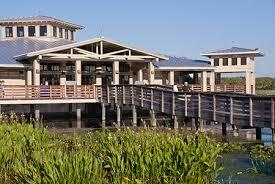 Green Cay Nature Center offers 1.5 miles of elevated boardwalk that takes you through 100 acres of constructed wetland. One Mile Chickee Hut Trail and the 1/2 Mile Tropical Hammock Trail are both wheelchair and stroller accessible, and there are benches on the boardwalk and around the outside of the Nature Center for those that would like to sit and enjoy the beautiful scenery and abundant wildlife. No pets, food or alcohol permitted on boardwalk. Free admission.